Maverick Aviation opened their inaugural location in Las Vegas, Nevada in 1995 and have seen their business do nothing but soar to great heights with now five bases of operation. It was an attractive choice to launch in The Entertainment Capital of the World, because it fit the high-end image that people typically associate with the glamorous city. “You don’t have to convince anyone to come here,” said Leavitt. And while the VIP, tourist-focused company offers a grandeur experience, one of Joshua’s favorite aspects about his team is their desire to be involved in the community and the extent to which they encourage the staff to be charitable. Tech Impact launched its workforce development program, ITWorks, in Las Vegas in February of 2016. Volunteers are an integral component of the program that serve as mentors, teach professional development sessions, and provide students with invaluable hands-on experience during an internship. So when Josh met Tech Impact’s Executive Director, Patrick Callihan, at a Society for Information Management (SIM) meeting, it was natural to talk about how the two organizations might be able to partner together in Las Vegas – especially since Leavitt serves as the Committee Chair for SIM Las Vegas’ Workforce Committee. --ITWorks is a free 16-week technology training program for young adults ages 18 to 26. Through 11 weeks of classroom study and hands-on workshops, students prepare for the industry-leading CompTIA A+ Certification. Through 5 weeks of internship, students build their resumes and real-world skills. Students complete over 100 hours of professional development training led by area IT and HR professionals. ITWorks holds classes in Philadelphia, Pennsylvania; Wilmington, Delaware; and Las Vegas, Nevada. ITWorks is a program of Tech Impact, a nonprofit whose mission is to empower communities and other nonprofits to use technology to better serve our world. ---The Society for Information Management (SIM) is a national organization that provides benefits including networking, career development, talent recruitment, leadership skills, programs, and publications to its members. Local affiliates, such as SIM Las Vegas, work to improve the IT profession in their regions in the areas of education, workforce, security, and legislation; among others. ---Maverick Aviation Group was started by an industry entrepreneur couple that had a vision to create a company that would provide a true VIP-level experience not previously offered in the helicopter industry. Today, Maverick operates the largest and most modern, state-of-the-art fleet of ECO-Star helicopters in the world in five bases of operation. In addition, Maverick Airlines and Mustang Helicopters were formed to provide additional services to clients. 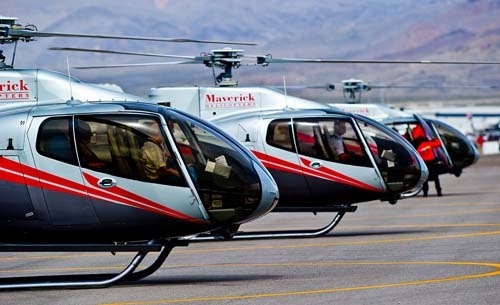 VIP service, the finest equipment and pilots, the highest safety standards and unique excursions make Maverick Helicopters the industry leader.